Here we are for a new Monnalisa's Spring-Summer 2017 season to see together what the “MUST HAVE” clothes to have in your wardrobe will be. Clothes that will be aces up your sleeve to pull out at the right moment, and with which to create original and fun looks, always perfect for the occasion. This is a season made of pink &red colors, but also overlapping items, super chic contrasts and risky matches, but ever refined combinations. We will now delve into the new trends, moods and season novelties but, remember, what is most fashionable, is what makes us feel at ease. But it is also what makes our children feel comfortable and confident. Ok?? 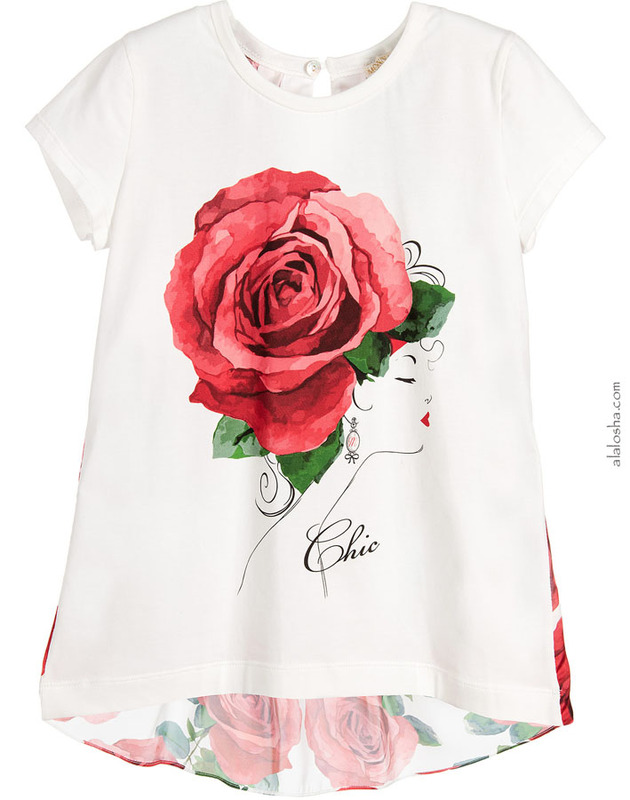 Girls ivory short-sleeved top by Monnalisa Chic. The front is made in a soft cotton jersey and has a lovely rose print, with diamanté embellishment. 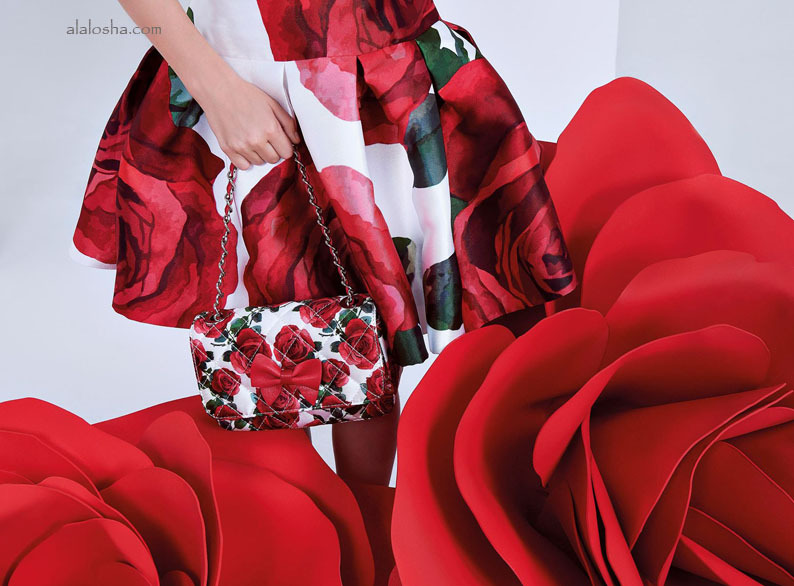 The rose printed, crêpe back is longer than the front, has pretty pleats from the neckline flowing into a flared, shaped hem. It has back button fastening to assist with dressing. 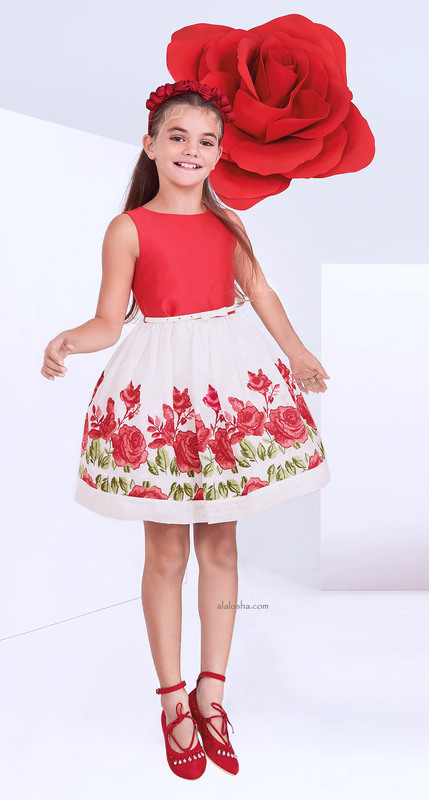 Girls gorgeous red and ivory sleeveless dress by Monnalisa Chic. 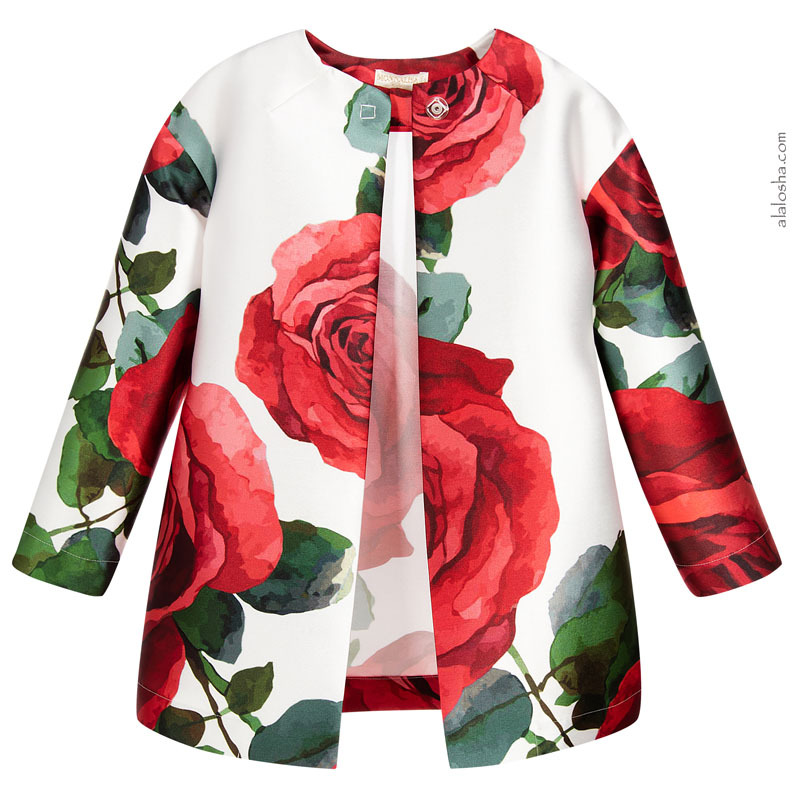 In a classic and elegant style, the bodice is made in polyester satin, with beautiful roses embroidered on the skirt. The skirt has a fabulous, full and feminine shape, fully lined in smooth cotton with attached tulle frill. It fastens with a concealed zip at the back and comes with a white synthetic leather belt with sweet bow buckle. Girls gorgeous ivory satin dress by Monnalisa Chic. 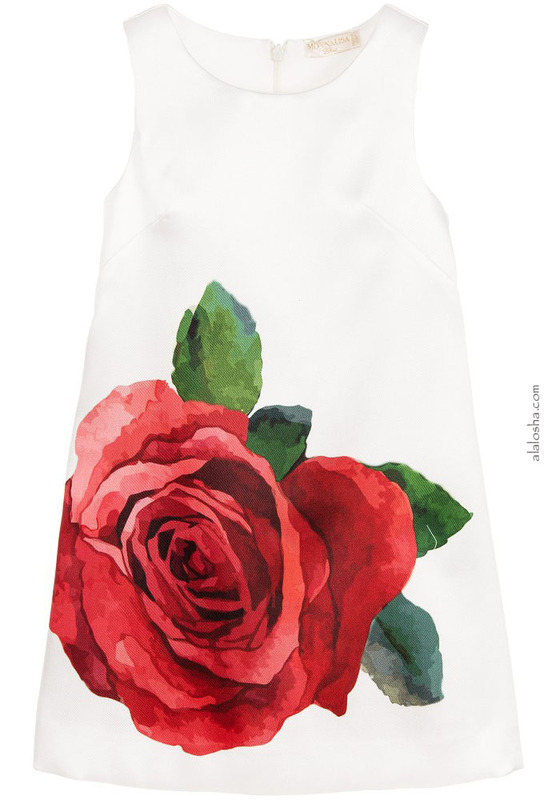 In a comfortable, sleeveless shift style, it has a bold red rose printed on the front and a concealed zip to fasten. It is fully lined in a lightweight cotton for added comfort. Girls beautiful red skirt by Monnalisa Chic, made in a woven polyester sateen with a lovely sheen. It has an adjustable waistband, large pleats all around and a concealed zip at the side. It is very full and has a soft, woven cotton lining with a frilled hem. Girls floral print slip-on shoes from Monnalisa. 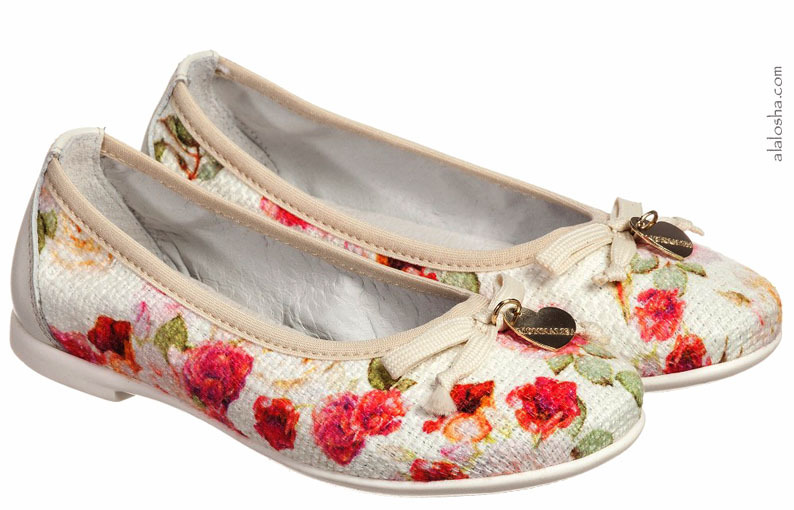 These pretty pumps have printed fabric uppers, with leather heels, a leather lining and inner sole. The toes are decorated with a beige bow and gold heart charm and they have non-slip rubber soles. Girls elegant ivory coat by Monnalisa Chic. Made in a woven polyester sateen with a striking print of red roses and green leaves, it has a simple, round neck with darts for a neat fit and closes with a concealed popper at the neck. It has concealed side pockets. 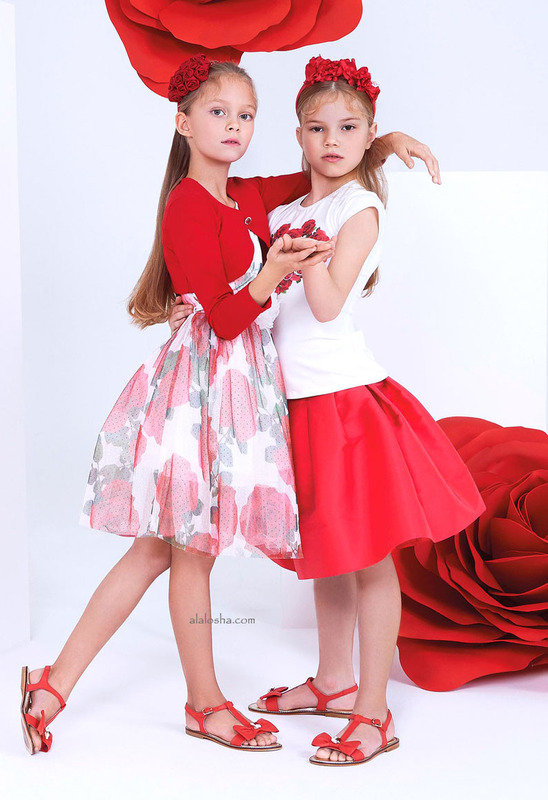 Girls ivory skirt by Monnalisa Chic, with a beautiful print of large red roses and green leaves. Made in a woven polyester sateen, with a lovely sheen, the skirt has a wide waistband, large pleats all around and a concealed zip at the side. It is very full and has a soft, woven cotton lining.